Related Series: Hidamari Sketch, Hidamari Sketch x365. Also, like I did with x365, I'm including the OAVs in the episode total. It's a new year in Hidamari Apartment. Yuno and Miyako becomes second year students, while Hiro and Sae becomes third years. And among the many freshmen who will be starting at Yamabuki high, Hidamari Apartments gains two new tenants; Nori and Nazuna. It doesn't matter how long you've been an anime fan. It doesn't matter what you think anime has turned into or where it'll go from here. There will always be a show that comes walking in from the sidelines taking you completely by surprise and waving aside whatever expectations you have. Such was the story of Hidamari Sketch, whose whole cast was such a delightful bunch that just the idea of watching it -- or REwatching it -- fills you with a certain childish giddiness. The general viewership must have thought the same, because Hidamari Sketch had an easily discernable budget increase going from the first season to x365, and if Hoshimittsu's first episode is any indication, that budget has certainly not been cut. In it, Yuno is on her way to have an English test returned, which she failed spectacularly and therefor had to do a retake. And not only is the scene where Yuno turns as white as ash -- even literally, crumbling away in the wind -- a rather spectacular indication of the budget, it also immediately reassures the viewer that its sense of humor has not been lost or watered down. And because Hoshimittsu is to its prequels what Aria the Origination is to the rest of Aria, or Natsume Yuujinchou San is to its prequels, it's easy to predict that it will not let the viewers down. The core aspects of Hidamari Sketch has not been tampered with at all, which is a good thing, because as quiet as this show is, it walks on a tightrope, balancing its humor and the more heartwarming moments while making sure not to let certain aspects take precedence over others. Another thing I really liked about Hidamari Sketch is the fact that, despite Yuno technically (and arguably) being the main character, the show really is a double comedy act between her and her best friend, Miyako. And if Yuno is the quiet, gentle one who learns to live by herself as she goes along, Miyako is her chaotic, exhuberant counterpart whose every waking moment can be turned into a gag or a play. And I'll be damned if I still don't know for sure if she is pulling everyone's chain or if she's really just like that. But hilarious she is, and that's why she's my favorite character in the whole show. Speaking of the characters; if I had one worry about Hoshimittsu, then that would be the two new cast members. Being introduced so late in the show, I had some concerns about whether they would be set up to steal the show from the main cast, and even if not; what kind of characters would they be? Well, thankfully, they did not steal anything. Instead, they neatly added themselves to the residents of Hidamari Apartments as naturally as any. Yes, Nazuna bordered on being needlessly and helplessly cute just for the sake of it, but thankfully, it wasn't made to be her "trait" any more than the others had traits of their own that needed to be showed in our faces again and again. I do not necessarily have anything against comedies like My Ordinary Life or GA Geijutsuka Design Class, but I'm still grateful that Hidamari Sketch doesn't subscribe to its rapid-fire joke assault directional style. 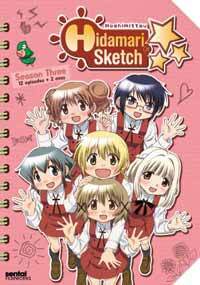 Hidamari Sketch seems solely in this to make you laugh, but also give you some time to breathe between the gags. And, much like the seasons before it, it still warms the heart when it wants to. Recommended Audience: For some reason, Yuno's bathwater is all transparent now, so she is shown in a little more detail now than she did earlier. (Just a little.) To be honest, it doesn't matter too much when you look at the whole picture, but it still made me wonder when I first saw it. Also, Yoshinoya-sensei is still being herself. Other than that, I can think of absolutely nothing objectionable.